Download the IGV from the following website: Download. This will install the BETA version of IGV, which might give some problems. However, since VariantDB switched to CRAM as its storage backend, using the BETA version is mandatory. Once the main IGV release supports CRAM files, we'll update this link. 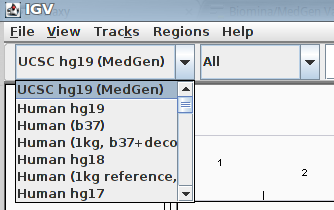 The Biomina/medgen galaxy server uses a cleaned up version of the UCSC genome build to convert BAM files to CRAM format. In particular, all chrXX_un and chrXX_random entries were removed. 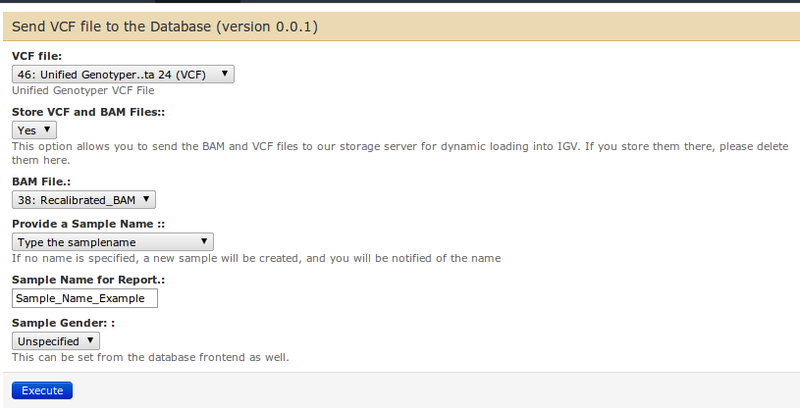 If the specified reference in the VCF/BAM file is not recognized as the same version, imported files are kept as BAM files. Unzip the file. It will require approximately 3.5Gb of space. You can delete the zip file afterwards. Analyze your sample, and call SNP/indels by GATK Unified genotyper. This is currently the only supported format. Select the "Send VCF file to the database" tool (under "Our Tools"). 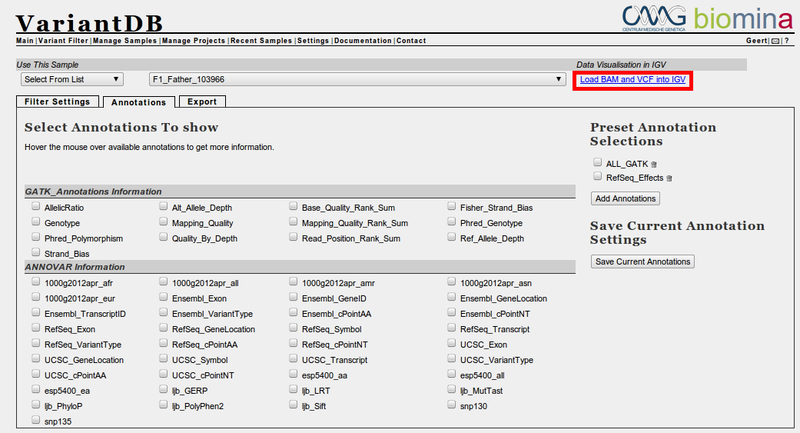 Second, it can be directly imported using the Web-UI Instructions are listed on there. Third, data can be imported using API. This is documented here. Results returned from the filter are presented in a tabular fashion. The first field in this table is always the genomic location of the variant. This location is a hyperlink to IGV. By clicking on the link, the display of IGV will jump to the location (+ 20bps on each side), and if present, the corresponding reads will be loaded from the BAM file.